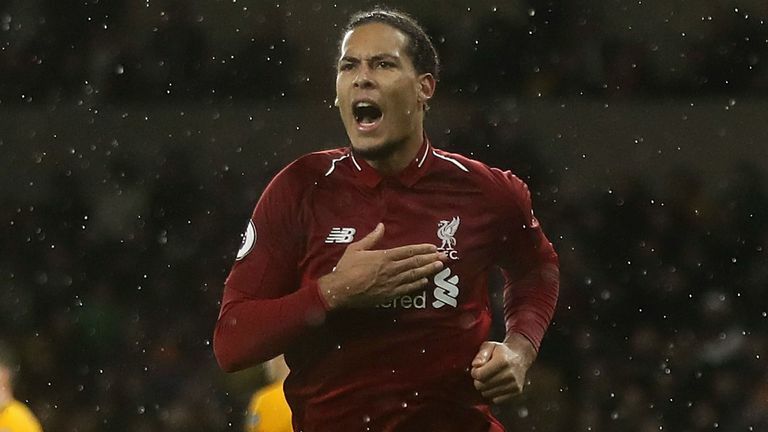 Liverpool are guaranteed to be top of the Premier League on Christmas Day after extending their lead at the summit with a 2-0 win at Wolves. In the previous 10 Premier League seasons the side top at Christmas has won the title eight times and the Reds laid that marker down with goals from Mohamed Salah (18) and the excellent Virgil van Dijk (68). The victory moves Jurgen Klopp's team four points clear of Manchester City, who play Crystal Palace on Saturday. 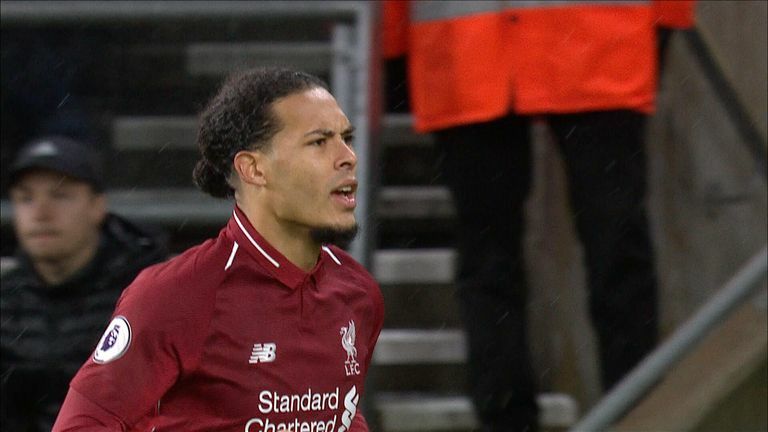 On a wet night in Wolverhampton, Liverpool failed to settle but Adama Traore could not take advantage of an early opening following a poor pass by Fabinho. 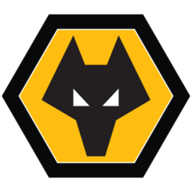 Wolves: Patricio (6), Doherty (7), Bennett (6), Coady (6), Boly (6), Saiss (6), Jonny (6), Neves (5), Moutinho (6), Traore (5), Jimenez (6). The Liverpool midfielder made up for that error by setting up the opening goal on 18 minutes. Ruben Neves failed to track his run down the right and the Brazilian crossed for Salah to skilfully flick home for his 11th goal of the season. Wolves looked a threat on the break but despite registering four shots on target in the opening half, Alisson was not severely troubled. Wolves switched to a 5-3-1-1 with Romain Saiss and Adama Traore given chances from the start. James Milner and Jordan Henderson came in for Liverpool. Liverpool looked far more comfortable after the interval with Salah a constant threat on the counter attack. He provided a touch of class on 68 minutes to double his team's lead. Van Dijk was on hand to finish Salah's pin-point cross to score his first Premier League goal for the Reds. From that moment it was game over and Salah could have added to his tally but Rui Patricio made some smart blocks. Klopp's men saw the game out in comfortable fashion and as Jamie Carragher noted on commentary: "We have a title race!" The Netherlands international is fast becoming the best centre-back in the Premier League, some would claim he is. This performance would add further fuel to that argument - it was a masterclass. Adama Traore got absolutely nothing out of the Liverpool defender, who even managed to match the striker for pace at one point. He's got it all. Jamie Carragher takes a look at Virgil van Dijk’s masterful performance against Wolves. Carragher was impressed with his performance in both boxes: "Van Dijk's been immense all season. His goal was as cool as you like, cushioning the finish in with his left foot." Salah has scored more Premier League goals than any other player this season (11), netting four goals in his last two away games. Only two teams - Chelsea in 2005-06 (49) and Man City in 2017-18 (52) - have had more points after 18 Premier League games in a season than Liverpool do this season (48). Salah has scored in each of his last six Premier League appearances for Liverpool against newly-promoted opposition, finding the net exactly once in each game. Wolves have lost four of their last six home league matches - as many as in their previous 34 combined at Molineux. Liverpool are unbeaten in 10 away league games (W8 D2) - their best run in the Premier League and longest since also going 10 unbeaten between October 1991 and February 1992. Klopp has now defeated all 32 of the British clubs he has faced as Liverpool boss in all competitions - before tonight, Wolves were the only side he had failed to beat, losing in the FA Cup in January 2017 in their only previous meeting. 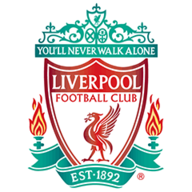 Liverpool have won 25 league matches in 2018 - their most in a calendar year since 1990, when they also won 25. 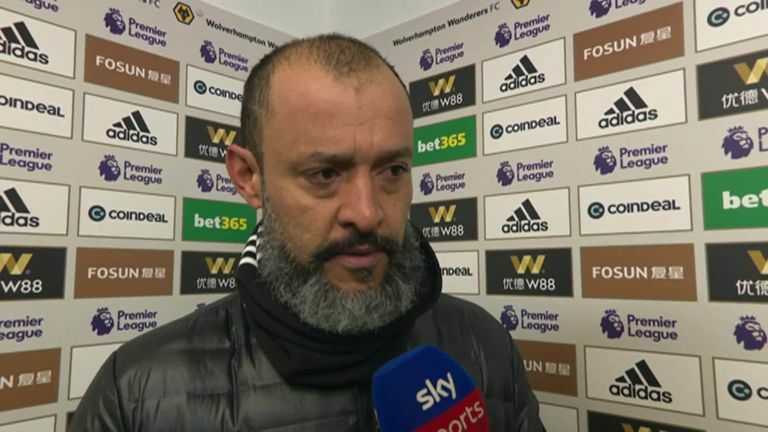 Nuno Espirito Santo: "The way we conceded doesn't give me any joy at all. It was a good game. There were chances for both teams in the first half, we could have done better in the final third and with final decisions. The only thing that gives me something to think about is the way we conceded. After a set-piece, a second ball, it's a total lack of focus that we lost in that moment so we have to look at that and analyse that moment." Nuno Espirito Santo was pleased with Wolves’ display against Liverpool but says he was unhappy with the way his side lost focus for the two goals. Jurgen Klopp: "So far it looks like a really special season, 48 points before Christmas is crazy. But there are other teams. Chelsea, Manchester City, Tottenham, Arsenal, will probably win, so then they have 40-something points, nobody is dropping points down to fifth or sixth. You will probably need 105 to be champions at the end of the season, you don't know." 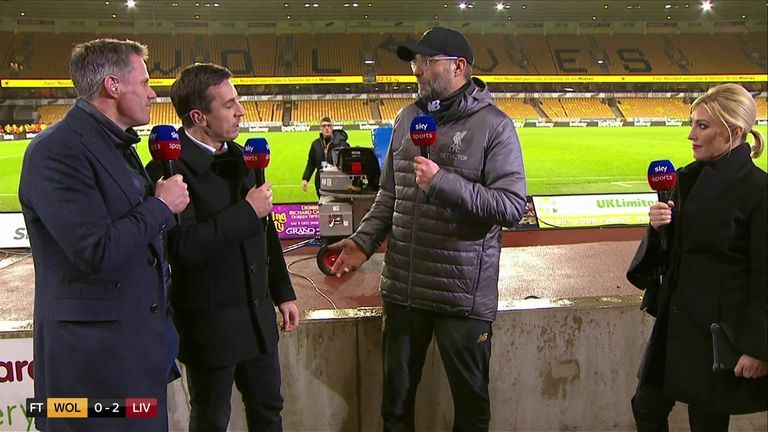 Jurgen Klopp knew his side would be in for a big fight against Wolves but was pleased with the way Liverpool dealt with the threat posed by Wolves. Liverpool host Newcastle on Boxing Day while Wolves travel to Fulham, a game live on Sky Sports.